The Curve initiative is a major development comprising a mixed-use, vibrant community facility with multi-functional spaces, and wider cultural offerings based around the arts with opportunities for performance and exhibitions. The 90m long x 15m high building's form, a curved 'tube,' features fully glazed entry façades, and opens onto two new public squares, created at each end of the building. The composite steel solution allowed for full flexibility in the design of an irregular column grid, and provided minimum depth cantilever façade support sections. The aesthetic of the circular hollow section columns has been retained and expressed throughout. The double-height performance space required column removal, for which composite universal column sections were able to achieve the spans in the shallowest depth possible. The constrained site utilised a single mobile crane to perform all lifting operations in a carefully planned three phase construction sequence, allowing free site areas open to other trades. 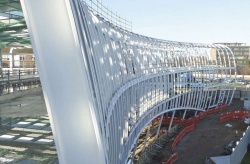 Detailed 3D modelling allowed efficiencies to be gained in specifying a constant bend radius for the façade members, and limiting the supporting tubular transfer beam to three discrete bend radii. This 45m curved CHS beam was then spliced using carefully detailed non-visible connections. Curved edges to the internal atrium required cantilever decking sections to arrive at site with the bend radii pre-cut. Staircases, both front and back-of-house, were formed offsite in steel and installed quickly and prop-free to open up the site to the follow-on trades. Detailed 3D model coordination allowed for accurate placement of pre-applied cladding fixings and secondary support steelwork.